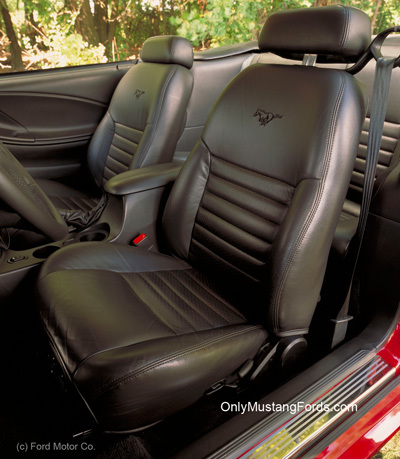 The 2002 Mustang was not quite as ground breaking a year, as compared to the offerings from the previous year, such as the Bullitt. But there were still prizes for eager Ford fox body enthusiasts, including this awesome and beautiful red Mustang Mach 1. Ford continued to offer two body styles, the 2 door coupe and 2 door convertible options, with it's higher performance and very popular small block V8 powered Mustang GT. 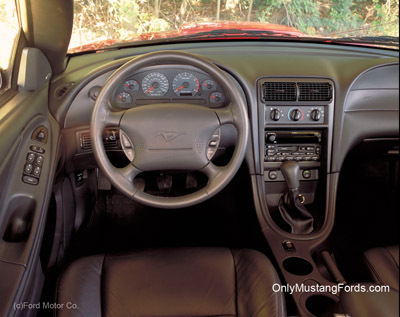 Changes in the exterior of the 2002 Ford Mustang were minimal, yet tasteful. And Ford, in keeping with the trend to larger wheels and lower profile tires, upgraded the base car to some new and stylish 16 inch wheels. Typical of a carryover year for the pony car, with few new features and also usual for this point in its model production run, sales dipped slightly to just over 142,000 cars. As seen with the continuation of it's evolutionary body styling, there were no major modifications to the interior panels, seats or dash, however the interior retained it's solid good looks, easy to read gauges and comfortable Aero-look cockpit. The Engine choices for the 2002 model year cars were the same power plants offered in 2001, with the standard 3.8 liter V6 continuing to produce a solid 193 horse power and very good fuel economy (MPG). Ford's performance offering in the Mustang GT and Mach 1 cars, was the relatively new and scrappy, 4.6 liter modular V8 engines,which kicked out a solid 260 horsepower, making these cars, some of the fastest production models available to the average buyer. EPA rated fuel economy was 16 mpg city and 22 mpg highway, which was reasonably close to the smaller V6's numbers. For the economy minded, buyers could choose Ford's optional 3.8 liter V6 engine, which produced a respectable 193 horsepower and pretty good gas mileage ( EPA rated 17 mpg city / 25 mpg highway). 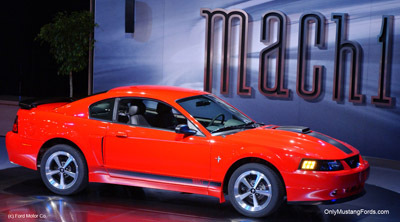 While the single V6 and V8's was the limit for engine choices this year in North America, Ford engineers crafted a special, Australia only SVT Cobra production of 200 units, which featured the 2001 model's high performance Mustang Cobra power plant with an exotic car like power output rating of 320 horse power !